A ‘risk reversal’ has been observed for several human carcinogens following cessation of exposure, but it is unclear whether it also exists for asbestos-related mesothelioma. We conducted a systematic review of the literature and identified nine studies that reported information on risk of mesothelioma after cessation of asbestos exposure, and performed a meta-regression based on random effects models. As comparison we analyzed results on lung cancer risk from four of these studies. A total of six risk estimates from five studies were included in the meta-analysis. The summary relative risk (RR) of mesothelioma for 10-year interval since cessation of exposure was 1.02 [95% confidence interval (CI) 0.87–1.19; p-heterogeneity 0.01]. The corresponding RR of lung cancer was 0.91 (95% CI 0.84–0.98). This analysis provides evidence that the risk of mesothelioma does not decrease after cessation of asbestos exposure, while lung cancer risk does. 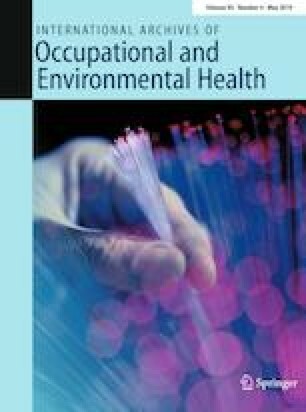 The authors thank C. Pelucchi from the University of Milan, who produced original results for the study of Italian asbestos miners (Pira et al. 2017). PB, EP and CLV acted as experts for the defense (PB, EP, CLCV) and the court (EP, CLV) in asbestos-related litigation.